The Louvre Museum has 8.5 million visitors per year. This blog was viewed about 82,000 times in 2013. If it were an exhibit at the Louvre Museum, it would take about 4 days for that many people to see it. 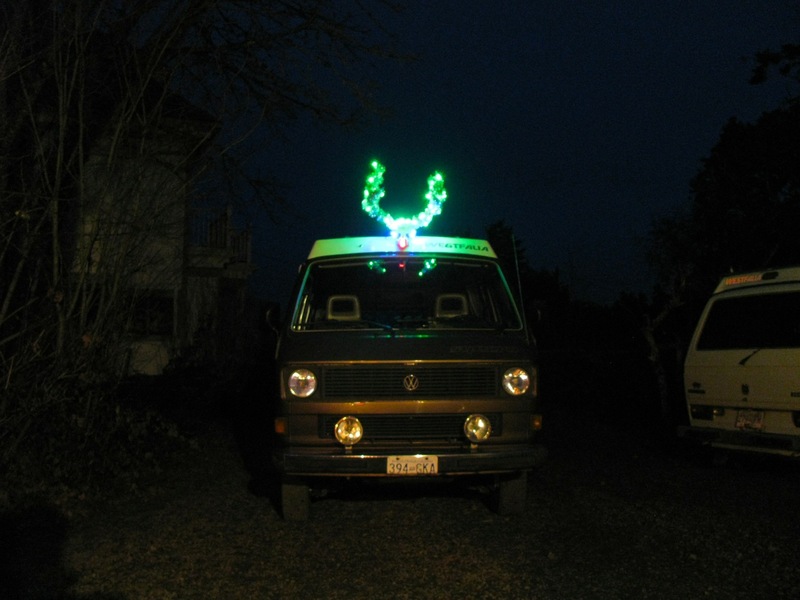 It’s a Vanagon (pagan) Christmas! If your are sipping your coffee or any other beverage as you read this, please swallow what you have in your mouth and put the cup down. I’m not taking responsibility for any spit takes that might happen when you see what I made. It started a couple of months ago when I was fooling around with some scrap aluminum and the TIG torch. I was adjusting the welding machine settings and rod size seeing what effect various changes had on welding outside corners. As I welded bits together I realized I could make a box of sorts and that would provide good practice on the seams. Well, i made the box, enclosed on 5 sides and I looked at it… what if I make it into a subwoofer enclosure? 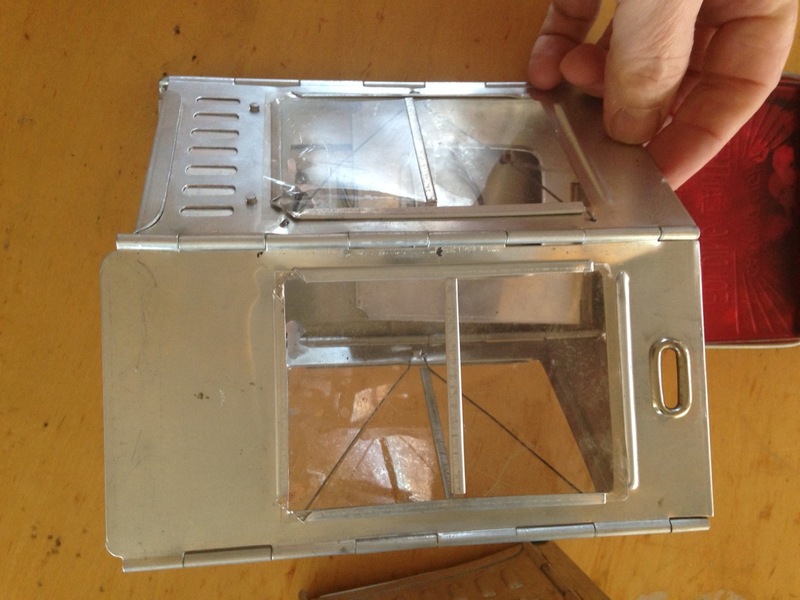 3/16″ thick aluminum is not what springs to mind to use to make a speaker box, but what the heck eh? 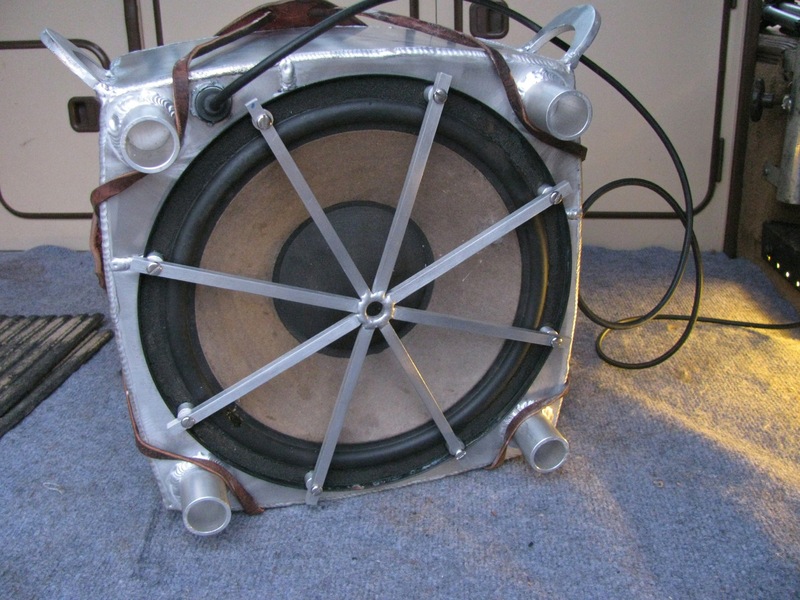 I had a pair of 12″ speakers in the garage, no idea what make, and I decided to use one as a sub. I added the 5th side to the box, actually pieced together from 4 bits, and cut a hole for the speaker. And why not four bits of tubing for legs? This was going to be a down firing sub. Oh and it was going to be a sub that paid very little attention to volumes, Q factors, etc, etc. I drilled and tapped holes to screw the speaker to the box, than I made a grill from some 1/4″ square section material. The grill pleased me, stiffer than I expected. 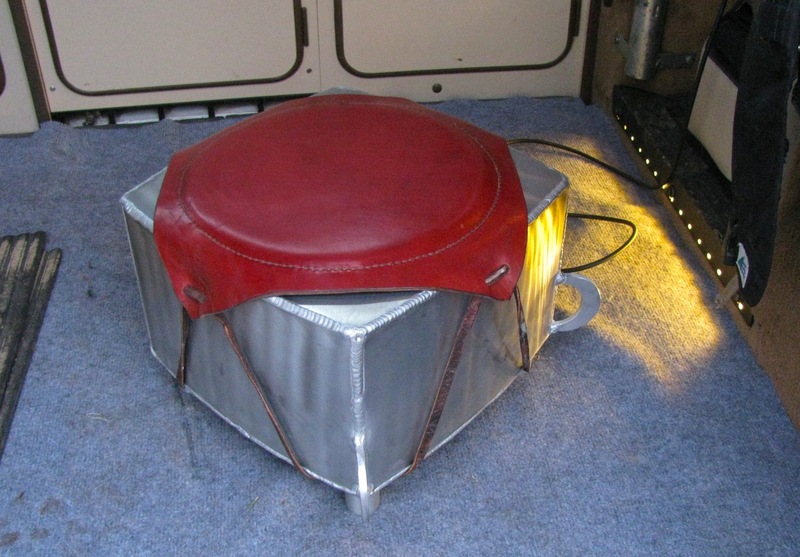 And just because I worried about how to secure the beast in the van, I welded on a couple of half moon bits to have something to attach a strap or something. Ok, so it looked kinda bare. 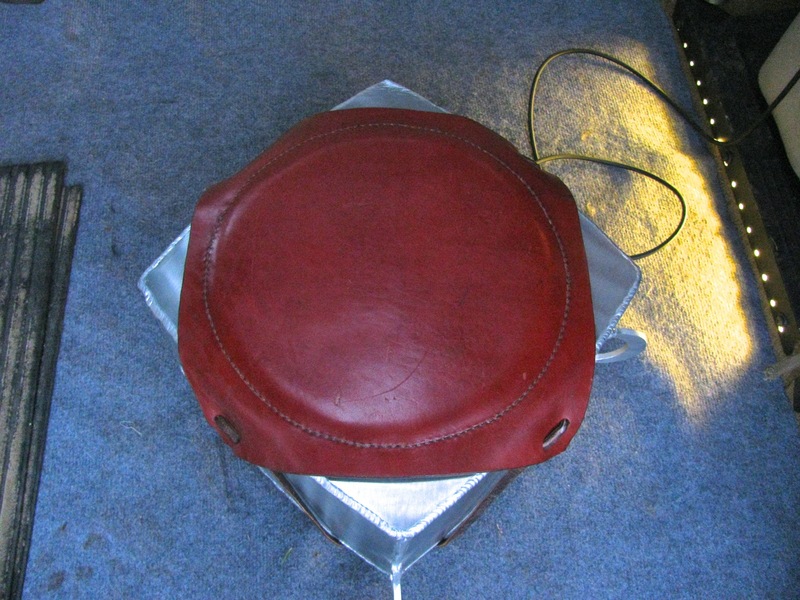 But I was recently given some leather so I thinks to myself “a leather pad thing on top would gussy it up some”. I cut a square of leather, a round of sleeping pad type foam, and some canvas as backing. 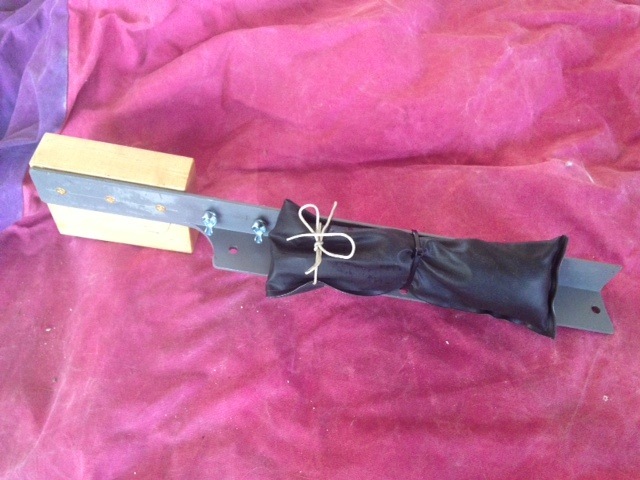 I sewed it all together (and I found that difficult, only sewn a little bit of leather before and never saddle stitched) and attached it to the box with a leather thong. 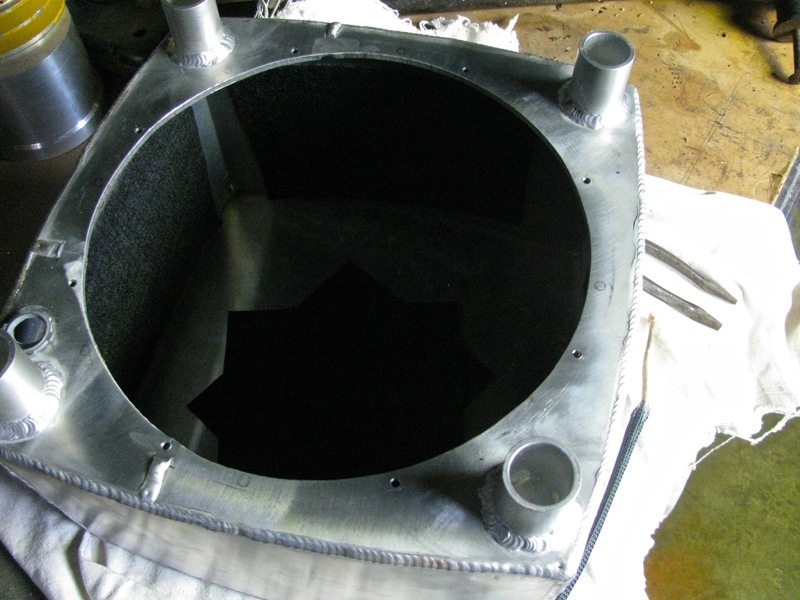 And now it looks like some sort of industrial ottoman or commode. Go on, look at the pictures and laugh, I’m used to it now. Yes, the sides are curved. Same scrap material that I made the underbody protection plate with. Paper cone and still in one piece. So how to power this thing? My head unit has 2 channel sub out jacks and I knew I had a spare amplifier in the workshop. An amp that was bridgeable so I could lead 2 channels in and have one channel (mono) out. I couldn’t find the damned amp, I searched high and low. Found all kinds of things (previous posts) but no amp. Good friend Stephen took pity on me and gave me an amp he had lying around. 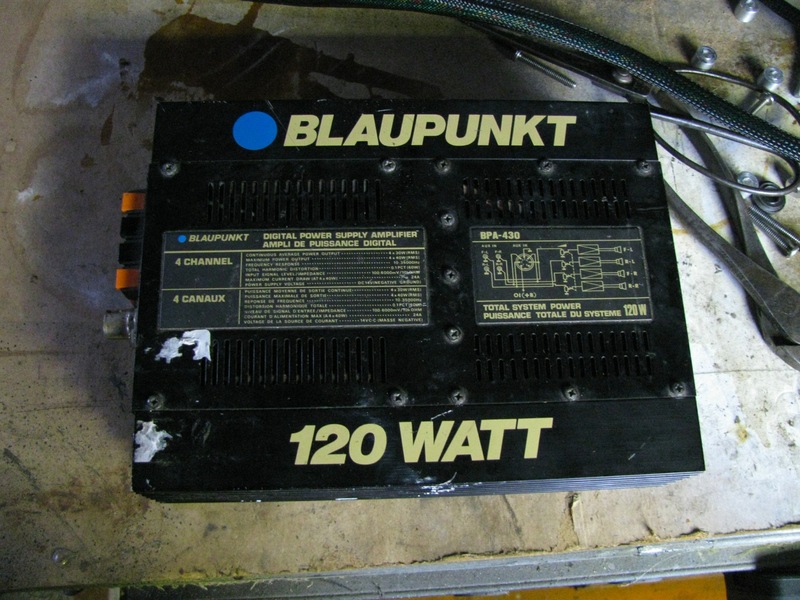 Nice old amp, a Blaupunkt 4 channel unit. It was not bridgeable, but it excited me. 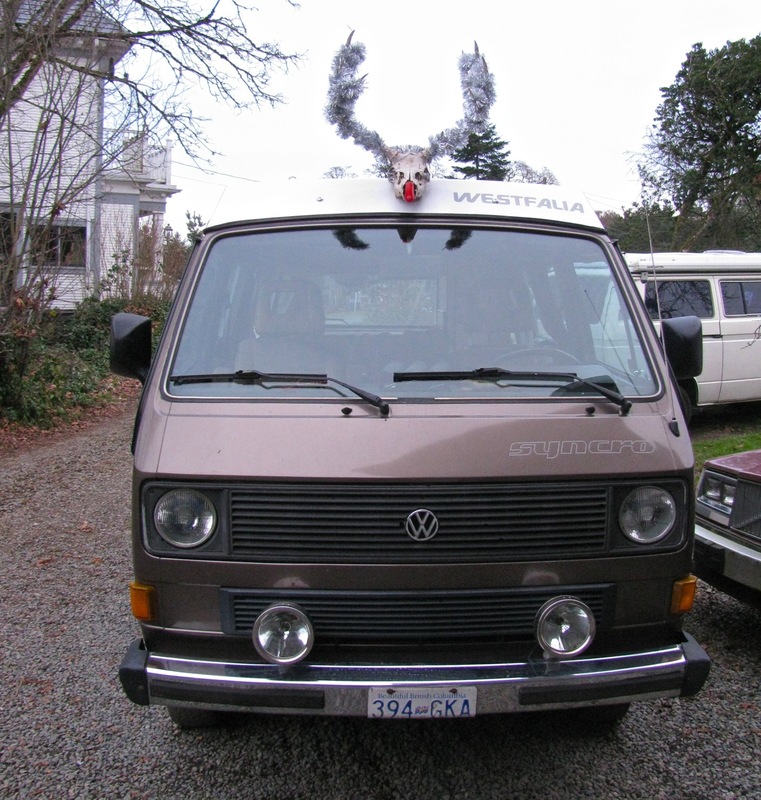 The existing stereo set up in the van consisted of a Pioneer DEH-P5000 head unit feeding an Alphasonik PMA-2030 amp (not bad vintage amp) under the driver’s seat. That amp powered the front door speakers, Boston Acoustics Rally (model number forgotten) 6″ mid in lower part of door and tweeter up behind stock speaker grill. Oh and those are fed via some separate BA crossovers. Back in the rear overhead cabinet are a pair of 4″ pioneer speakers, powered directly from head unit. I decided to pull the Alphasonik amp (not bridgeable) and use the Blaupunkt to power the front and the rear speakers. Was a little bit of a pain to do that, but I did manage to reduce the tangle of wires behind the dash (I can’t really fault the previous owners of the van, stereo installs seem to bring out the slipshod in all of us) and I squeezed the amp up on the crossmember behind the glove compartment. That all worked well. When I say well I mean the stereo system still worked. But I don’t have my sub installed! Where the heck is that lost amp? I found it the other day, not far from where it was supposed to be. It had fallen, or was placed (yeah, by me) in a box of fibreglass cloth and was covered by same. Callooh callay! I cried (no, I didn’t) when I found it. Some futzing and farting around and it was installed under the driver’s seat and finally my sub made noise. And what kind of noise? Well, a kind of thumping booming noise. It does pump out the bass, it does make things rattle, and once I fiddled with the sub woofer settings on the head unit (low pass and high pass filter adjustment) it sounded rather ok. I don’t think it is as tight or as controlled as a subwoofer should be, but considering everything about it, it is acceptable. I have it connected to the amp via an RCA jack so it is easily disconnected and removed from the van. 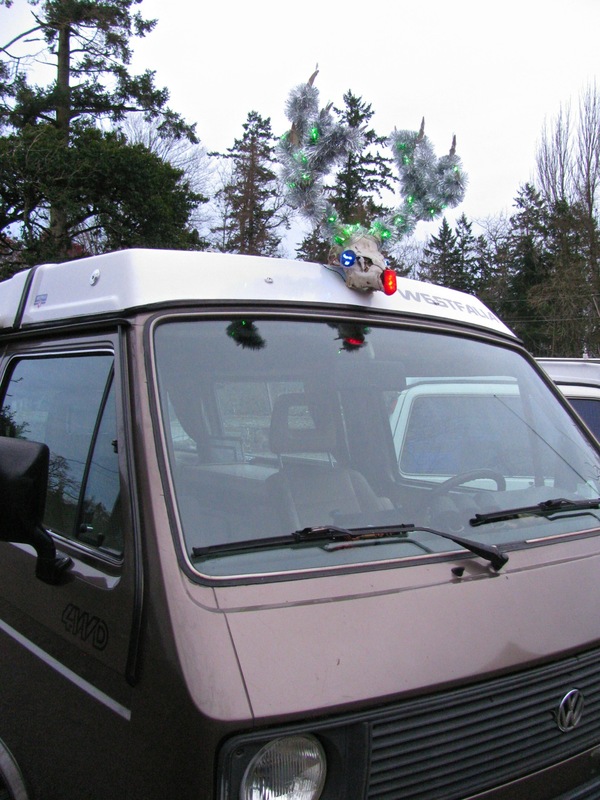 Right now it sits behind the passenger seat, but I can extend the cord and I might try other placements. 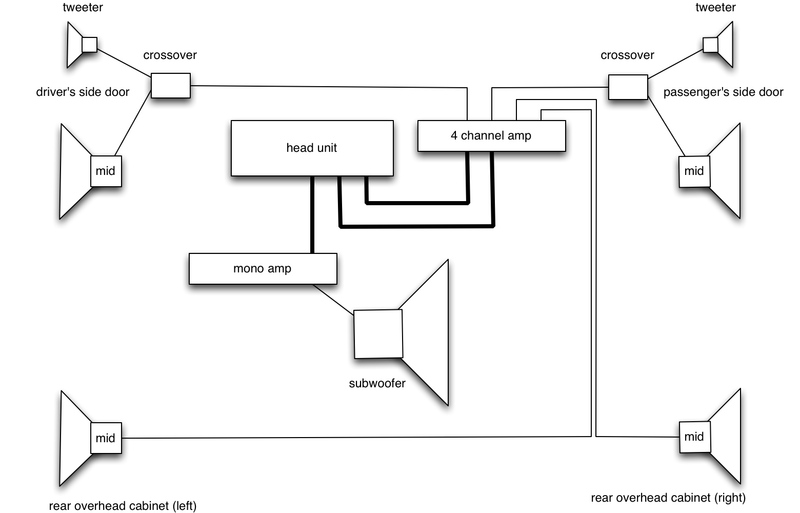 Oops, forgot, I made a quick sketch of the stereo system layout. Note the connections between head unit and both amps are via RCA jacked lines. My northern correspondent (Phil Z.) sent me this today. Edit: So can anyone nail the age of the Chevy? 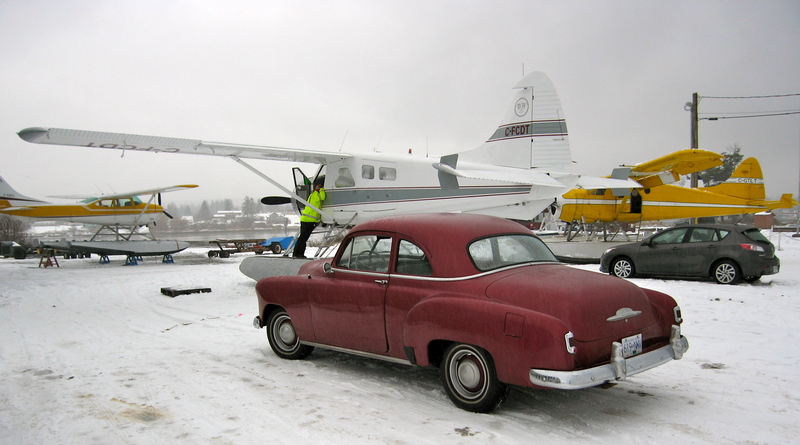 Could it be, judging by the pics in the brochures here,a Styleline Coupe, ’49-’52? J. Felder sent me some pictures. 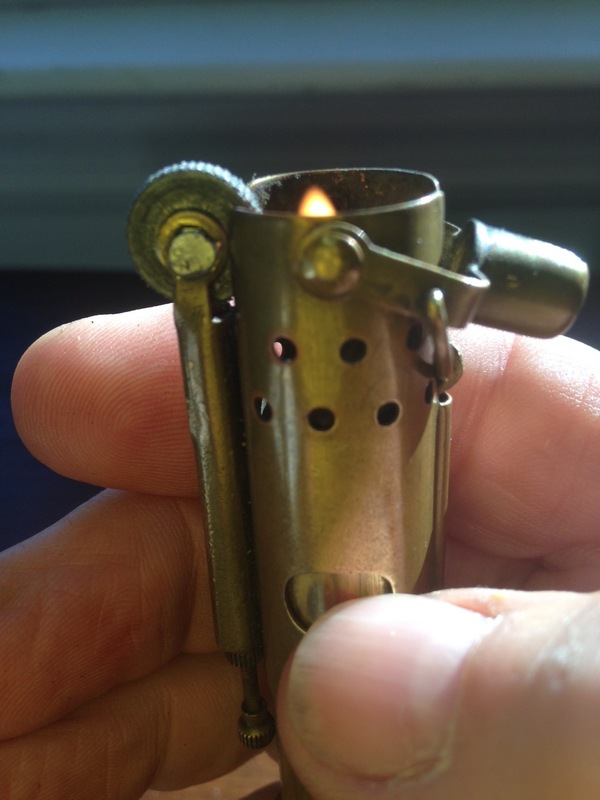 First up is a lighter made from a shell casing. 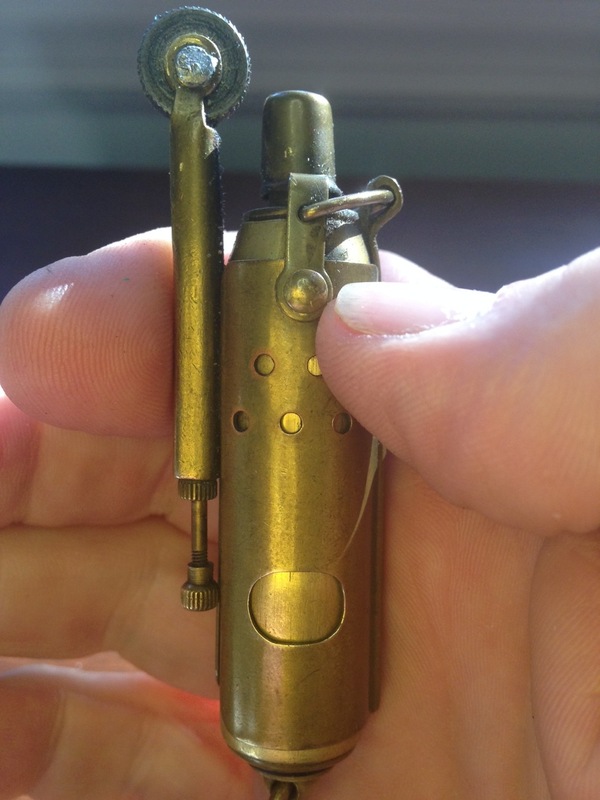 “WWI era trench lighter lost its flint wheel axle screw back when it was in heavy use (I’ll say no more about that) in the early 80s. It sat in a parts bin until last weekend when I finally admitted to myself that locating a replacement wasn’t going to happen in the time I have left, either, so I used some alien hardware for the job. 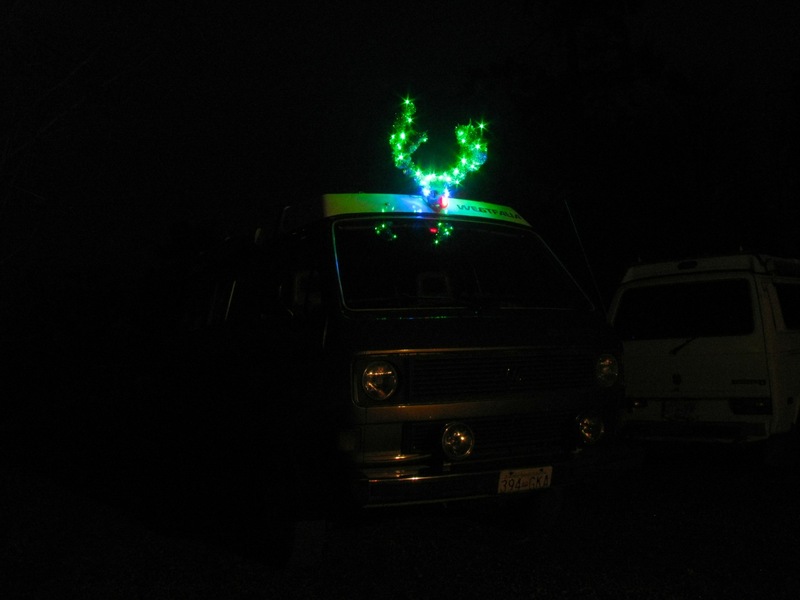 It now is the official lighter of my Westy parcel shelf. 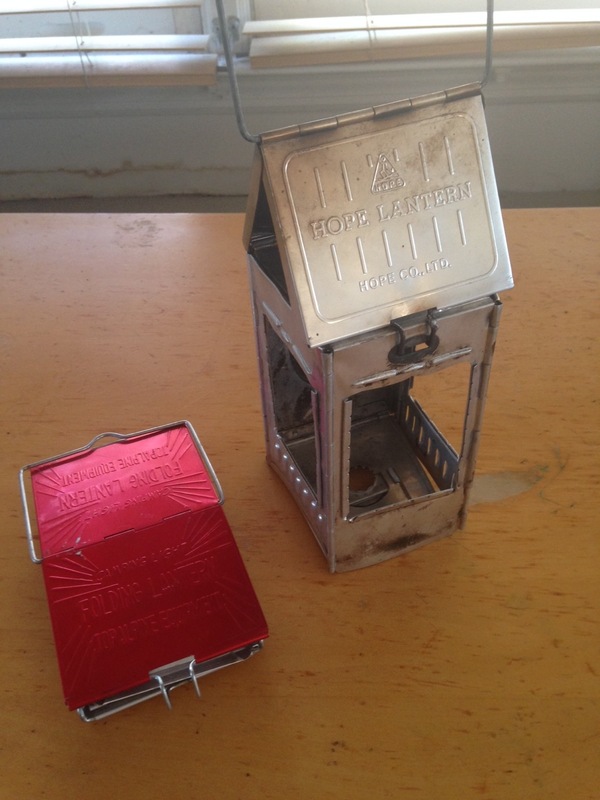 “The one on the right is my old late 60s camping lantern. The one on the left is my late-70s replacement, which has never seen much use as flashlights were invented by then. The second picture shows how they fold out from flat. Reconditioning the old lantern which was curved in a way that Steve Jobs should have lived to see too a lot of hinge straightening and gentle bending. It’s burned candles for so many hours that the springs have lost temper so it doesn’t pop open by itself. New mica windows for the old one should arrive Monday. 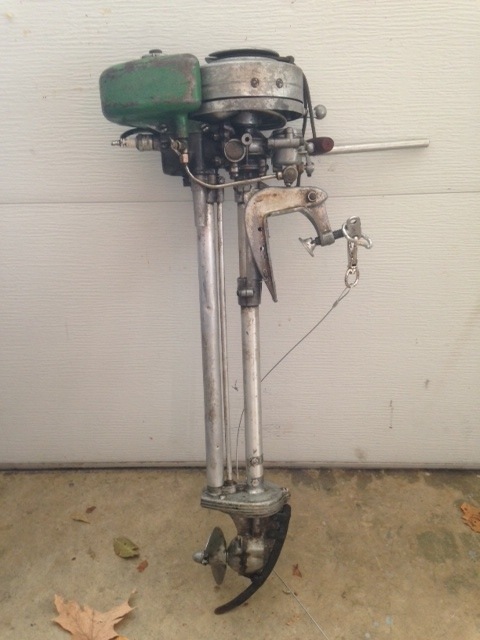 Canoe motor mount and vintage outboard. 30 and thus was likely made before lunch on day 1. Once primed it starts on the first pull. A video of the motor running.